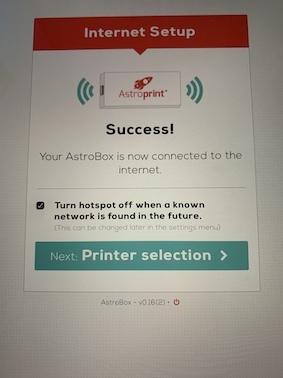 While doing the the Astroprint setup, after a successfull connection to the internet, the next tab is Printer selection instead of connecting to account like in the different instructions i saw. After i press that tab it just is “loading data” for ever. When i open a new browser tab with the 10.10.0.1 it just says “beginn setup” again. although as soon as i unplug the astrobox, after that the wifi from the box is not visible anymore, which meant i had to reflash it to start the process all over, but like i said its the same every time. Not sure if this is the issue I had but I’ll give it a go. I setup my astrobox using a network cable to my router. Once I was all setup I unplugged the network cable and I couldn’t connect to the astrobox. I reconnected the network cable and got connected again, then from the astrobox dashboard had to go into settings to set my networks ssid and password. Then when I disconnected the network cable it would connect to my router. Like I said, I’m not sure you are describing the same problem but it sounds close. Would be the same if you were using a wireless dongle. If you didn’t enter in your network ssid and password somewhere, then it won’t have anyway to connect when you unplug it, or remove the wireless dongle. Give it a go and see where ya wind up. Well i did the standard connection procedure setup, where i had to select my network ssid and enter the password. But i did not add a ssh file and add it there. To my knowledge this shouldn’t be necessary though. No ssh should be required. Can you double check your ssid and pw to more there weren’t any typos? Yes no typos, i have tried it multiple times. The ssid is just a selection anyways. What version of Raspbery PI are you running? What are your wireless network settings? Do you have Mac filtering turned on? What networks setting do you mean? From the wireless access point what setting are configured on that device for the SSID your trying to connect to? A/B/G/N? WEP/WPA/WPA2? What brand of AP is it? From the AP management portal do you see the AstroBox connected? Is the AstroBox getting a correct IP address with a default gateway and DNS server? I managed to connect to the asto box via typing in the url to connect it to my account, but i had troubles getting it to work smooth, it was slow and dropped the connection many times, settings did not work as i wanted etc.